Chanting “no more coal, no more oil, keep your carbon in the soil,” approximately 80 members of the Boston University community rallied on Marsh Plaza Wednesday afternoon, urging the university to divest funds from fossil fuels. Divest BU, a coalition that advocates for divestment movement on campus, organized the rally when they learned that the BU Board of Trustees might make a decision on divestment this week, Divest BU Secretary Masha Vernik said during the rally. Throughout the rally, Divest BU volunteers handed out pieces of orange felt, the symbol of divestment, for participants to pin on their clothes. The group of students, faculty members and alumni marched towards the BU Castle, where they believed the BU Board of Trustees was meeting. They then circled around the entrance to the Castle and placed a ballot box filled with slips of paper on the steps of the building — the goal, Vernik said, was to symbolize how participants would vote on this issue if they had the opportunity to do so. Kalman Gacs, a 2007 College of Fine Arts alumnus, said when it comes to divestment from fossil fuel, BU is lagging. “It’s really pertinent that we do something about climate change, and currently, unfortunately BU, in a lot of ways, is on the wrong side of this issue,” he said. Vernik said the university should take a moral stance on the issue of climate change by divesting from fossil fuels. Members of BU Student Government also took a stance during the rally — Jane Dimnwaobi, the SG vice president of internal affairs, said it is important for the Board of Trustees to know what students want. Dimnwaobi said poor people and people of color tend to suffer more from environmental disasters, and board members are less likely to be affected by the effects of climate change. “I’m sorry, but the majority of the Board of Trustees are excluded from these honorable [poor people and people of color],” she said. 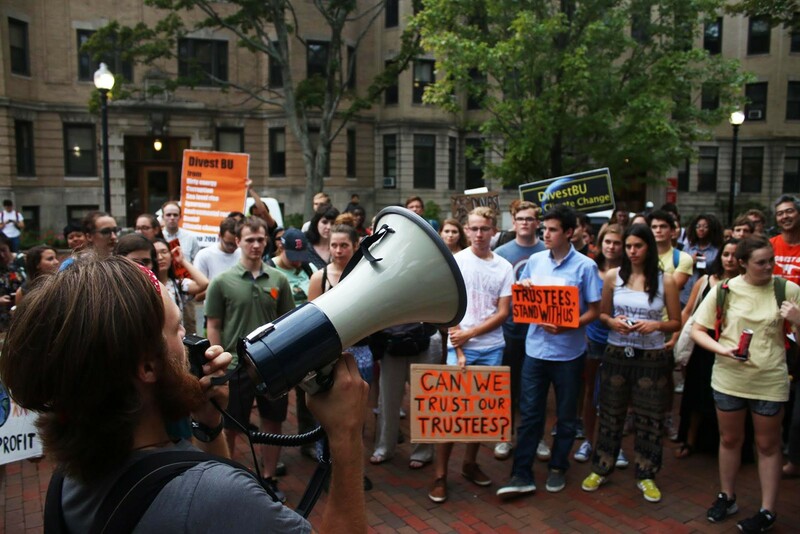 The BU community’s effort toward fossil fuel divestment can be traced back to 2014, when a delegation of 245 professors from nearly all of BU’s school and departments submitted their petition for fossil fuel divestment to President Robert Brown, The Daily Free Press reported Sept. 10, 2014. Nathan Phillips, an earth and environment professor, said he is impressed by how many students supported the rally. Desmond Molloy, a sophomore in the Sargent College of Health and Rehabilitation Sciences, said BU should consider investing in other businesses.